I did not know it was possible to drive through four counties and only hit about eight miles of pavement. Welcome to Oregon! 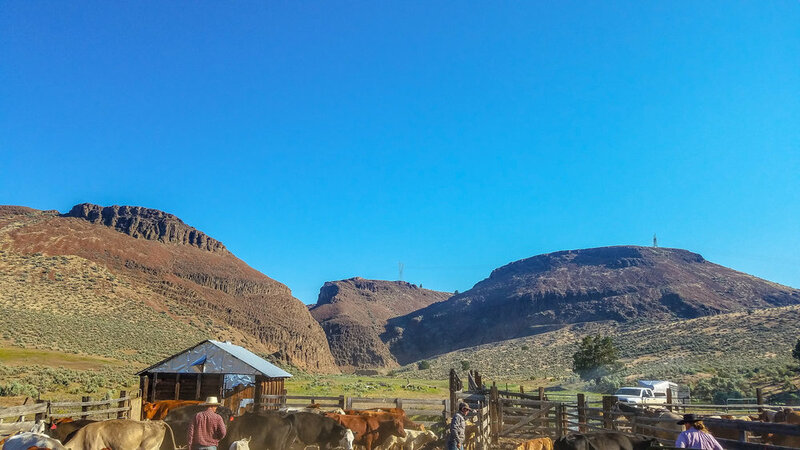 I had accepted a day working job for a week receiving cattle up on the Malheur National Forest for the Elder Ranch, owned by Rob and Kristy Elder, located in Riverside. I would be teamed up with Lacey, their daughter who is also growing a herd of her own. The old railroad town of Riverside has been absorbed by the Juntera community. The Elder Ranch sits on the old town site, their meadows run to the fence line of the town’s cemetery. It doesn’t take long to realize that although the post office may no longer recognize Riverside as a town, folks out there have their own sense of community not bound by zip code, grange hall, or branding iron. There is always a level of uncertainty going into the unknown. How would I do during my first time in the forest? Could I handle 5+ days horseback for my first time since my brain injury? Would I savvy and keep up to their style of working? I recognized these thoughts and feelings for what they were, but it was game time. No backing out now, right? I pulled in, turned off the Chevy, and went in search of Lacey. After getting a bearing on where I should park, where my stuff should go, and where to tie my horses, I went back to move the vehicle. It wouldn’t start. Best we could figure was a starter. I knew we couldn’t do anything about it now, so we hooked up a chain and Lacey pulled my rig out of the way. The problem would be here when we got back I figured. Although I had been to Juntera many times (it’s one of the ways out of our cow camp) I had never been on the route between Riverside and this small ranching town on Highway 20. 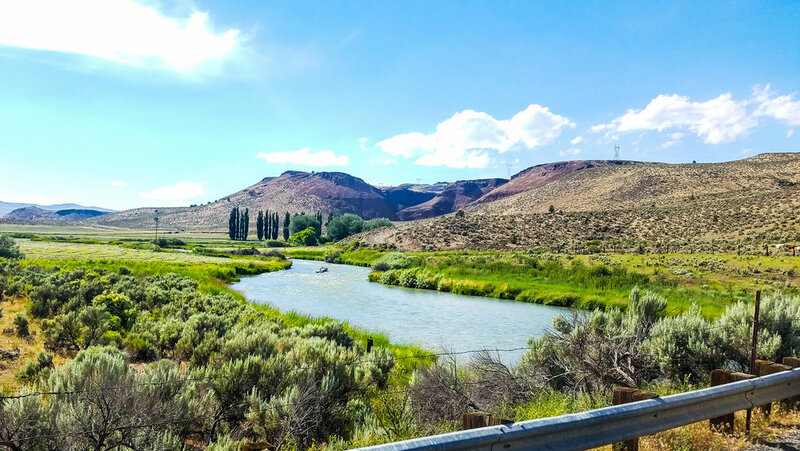 I followed Lacey with the extra truck and trailer across the Malheur River, up over the hill, to the familiar café, The Oasis. We decided on a quick dinner, so I ordered a coffee and French Dip as experience has taught me that order is pretty hard to mess up. My gut feeling served me well as the meal hit the spot and gave me a slight caffeine boost for the trip ahead. From this point on, everything was new country. Drove through the small community north of Drewsey tied together by the Otis Field Road and I fell in love with the beautiful meadows surrounded by high desert peaks. It rained for most of the next few hours as we wound our way through the forest and closer to camp. My focus was split between my Audible book (more on that later) and keeping up with our location. Total honesty moment: this desert girl gets lost in the pines. The best I could do was keep track of the signs we passed, hoping to have a reference point if anything went wrong. Signs kept me abreast of which county we were in as we went from Malheur to Harney, Harney to Grant, and Grant to Baker. That’s not much to work from, but with a few campground signs and a vague idea of how many turns we made, I hoped it would be enough if needed. Through the trees I could see glimpses of the meadow that would be home for the next week and it looked like a little slice of paradise. Well, if paradise looks like a portable cow camp to you and for me, it was spot on. A fifth wheel trailer, a panel wrangle pen, and a temporary barn had already been set up. 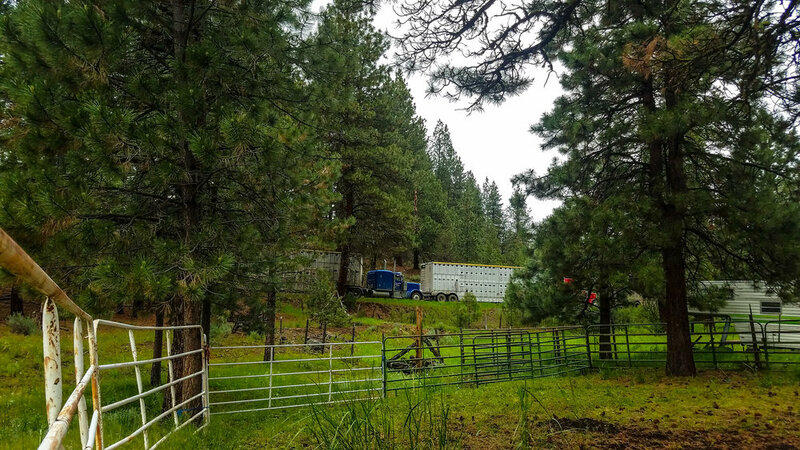 I took in the smell of the wet forest as we unloaded horses and put away gear. I found homes for my totes and bed roll, helped unload the food and pack dog houses around. We ran out to the Phone Booth for a few minutes to let everyone know we had made it then turned in early. Tomorrow, the work would begin. Our horses managed to pull their head out of the lush feed to wrangle in that first morning. We caught horses, adjusted gear and trailered out. We could see the bottom end of the field where the cows would end up from our location in camp. Regardless, there were multiple roads and several pieces of private and Forest Service allotments to pass through to where we would receive cattle. We ate Pop Tarts and chatted, Lacey giving me as many landmarks as possible to create the mental map in my head. I have learned to remember all the directions you can as they will make sense when you get there, and this week was no exception. We pulled into a smaller, but just as lush, meadow adjacent to a set of shipping corrals. They were simple but more than suited for the task. We unloaded horses to check fence on the pasture we would move the cows to, showing me the river where the expected pairs would overnight. I learned how desert rocks and forest rocks varied as I slipped under my horse on a side hill. Thank goodness for the broke ones! Sometimes that one mistake is all you need because I didn’t make it again. We were quick on the fence and the trucks were running behind, so Lacey and I had a few hours that felt like a stake out. We had snacks, chatted, snoozed and then repeated the process again. Finally, the semi’s arrived and we got everything unloaded. We resumed stake out status while we waited for everything to pair. Several hours without much progress left Lacey with a decision to push them unpaired or leave them in this meadow. We left them and headed back into camp. I gained an appreciation for the Pop Tart and Coke breakfast combo this morning! Growing up the daughter of a Pepsi-aholic and not having time to brew my regular magic, it worked out perfectly. I haven’t had pop in years but a girl can’t just drop her caffeine level from half a pot of coffee (or more!) a day to nothing. Don’t judge! This migraine-fighter was glad for the mix up in routine, but I am definitely thankful to be back home with my regular, IV-type consumption of coffee! Arriving at the corrals the next morning, two things were apparent. The good news was the cattle were paired up. The bad news was that they escaped the holding pasture. We gathered most everything up and trailed them out to the intended allotment. I started to grasp how to move through the forest, how cattle think they’re hidden in the trees, and where we were in relation to anything else. A gate count indicated we were out a few pair, so we went back and made a second push. This time they had a trail to follow and I understood where they might fall away. I also cannot stress enough how nice it was to have Lacey’s dogs along and to be working with dog-broke cattle! Lacey and I had been spoiled up until this point. The horses would wrangle themselves in each day as they heard us moving around or at least when we called them with grain. Now, they knew they had us buffaloed. From this morning forward, we would walk across the meadow, dodging standing water and streams that ran through. We emerged each time with horses, as well as being soaked through from our thighs down. That moisture would often keep me wet clean through until changing that night, no matter how warm it got. Today was our second truck day and everything unloaded a bit smoother. We made a couple of trips to get cattle pushed down to the river for the night. We then scooted back to camp, took care of horses and dogs, and lit out for John Day. We needed fuel and I cherished the opportunity to see the main drag of Prairie City again, if only in passing. Lacey was able to check in with her family about trucks and I received voice clips from my boys. Oh, how their little voices made my day! I swapped migraine experiences with a friend via Messenger and Lacey took me out to eat at the Squeeze In. Breakfast burritos and sweet potato fries and coffee never tasted so good! As a side note, when I haven’t had coffee in several days, I apparently adopt a facial expression that is both humorous and blissful as I take that first, coveted sip! We headed down to pick up our cows. We thought today might be easier, as our cattle had beat in a pretty good trail on Tuesday. If you want to hear God laugh, tell him your plans. Or work with cows. It’s about the same either way. The ground was saturated from the heavy rains the night before. Moving was slow as our horses sank over their hooves in rocky, steep ground. We knew it had rained steadily the night before but had not realized the flash floods that rain created. My ignorance made me hesitant as I ran along the river banks, pushing cattle back out, not sure how water really affected the ground in these conditions. Then, we hit the river crossing. Cattle had been pretty good at lining out over the pavement to cross the culverted river below. This time, they were scattering everywhere. At one point, Lacey and I switched positions, without really knowing where the other was. The meadow grass along the bank was littered with down timber and standing water on the over-saturated ground. It was the perfect situation for a dog and her male saved our bacon! I climbed out the other side in pursuit of the girls who could not find it in their heart to follow the path of least resistance. This night was so awesome. It was late, but it was my first shower since Saturday. Kristy had also been to town so there was fresh salad and take-and-bake pizza enjoyed in the living room with their family and hired guy, Seth. That night I climbed into a clean bed in a warm house and life was good for tomorrow, I would ride the desert! We had a family style breakfast in the morning before heading out to saddle horses. Kristy not only made us all breakfast but chauffeured us around to our circles. It was a treat to ride some country that was “just over the hill” from a road I’ve driven for years. Oregon always blesses me with new surprises, of live water or pinions or meadows where I would not expect them. Eventually, Lacey and I hit the top, split up, and rode our respective circles down. After meeting up with Seth and Rob to pen the combined gathers, Lacey and I trailered out again. This time we were after a few escapees. They all had been holed up a while with healthy calves at their side and wanted to act “wild.” It was one of the slickest trailer loadings I have had the privilege to take part in as these old girls remembered they were, in fact, domesticated. We hauled them home, then pushed the cattle for tomorrow’s load across the river. Once there, we sorted out pairs of slick calves. Can’t send them to the forest without a calling card, right? We had two to three ropers and two to three on the ground. Though the sun was sinking lower and the wind was picking up, no one questioned whether we were quitting. It was understood that we’d brand any slick calf we could find. In a world where folks quit when things get hard, it was refreshing to be around a group of like-minded people. We packed everything up and headed back to the house. We introduced Seth to the old Dixie Chicks song, “Earl had to Die” as he was riding a colt by that name. There was more pizza and then bed for tomorrow, we would ship the last load of trucks. It was breakfast, and saddles, and trailering to the feedlot. We gathered the overnight lot and sure enough, we had one saucy calf that managed to escape branding. They sorted him out with another calf and a cow into a smaller pen separating the rest of the herd with a set of panels. Seth and I tried to push the calves around, looking for a shot. About then, the Charolais calf we were after decided to take the panels, knocking them down and effectively tangling up his feet. Knowing he’d figure his way out of the mess pretty quick, I got a head loop on him. He untangled his feet, we pushed him back towards the makeshift pen and I did my best to not windmill the calf I couldn’t get short on. Seth picked up two and the rest of the shipping seemed to go smoothly. The trucks pulled out, we loaded horses to head back to the house. Lacey and I threw the bare minimum in as we would just be up there for the night. By now, we had the routine of syncing my phone with her truck down, so we continued our journey of Girl Wash Your Face as we headed towards Juntera, grabbed a burger, and climbed into the Malheur National Forest once more. There is something to be said about a snack of frozen breakfast burritos warmed on the camper’s propane stove, accompanied by a whiskey and Coke (with our last Coke, of course.) We talked of books and cowboying and life, all the good theological topics that are enhanced by copious amounts of time spent horseback with someone in a far-off cow camp somewhere. By now, I was really getting homesick for Sam and the boys. I don’t think I had been separated from all three of them for this long ever. This week served as not only an opportunity to cowboy in the forest and step out without Sam, but we used it as an example to the boys. Many of you are aware of my “dental debacle” I have been working through the last few months. This job earned the last bit of funds we needed to pay for this entire situation IN CASH! This isn’t huge to some, but we hope our boys gained something by the sacrifices Sam and I make. I woke early Sunday morning to complete my Bible/Devotional/Morning Pages routine. I rolled by bed, packed my totes, and began hauling it all out to the trailer. This was partially from being fired up by Girl Wash Your Face and partially to hustle our day along. There is “many a slip twixt a cup and a lip” and until I made it back to Princeton, my week would not be over. I waded out into the soppy meadow for the last time this trip and wrangled the horses. Between the ground drying up and the types of cattle, the herd was spread around. We got everything bunched, moved and turned out. Victory! It was a muffin and canned lemonade kind of day as we made our way down the mountain on a different series of roads. We listened to the last half hour of the book, also taking in the Acknowledgements and Questions to the Author portions. From there, Lacey pointed out landmarks and told me about the different ranches we were passing. I still didn’t feel like I could be a forest survivalist or anything but was slowly gaining more perspective on where we were and where we had been. Of course, the over-tired, girl-silliness kicked in as we listened to music and our phones occasionally got enough service to receive notifications from the outside world. After being protected beneath the canopy of pines and confines of a few meadows or creek bottoms, everything felt like the outside world. We stopped off in Juntera for shakes. I honestly can’t give you an unbiased review of the shakes at The Oasis because let’s be honest, any ice cream-based product after cow camp is pretty dang good. I again looked at the country as we headed toward home, enjoying the happy Pyrenes we passed as he guarded his goat flock and gaining greater perspective on the river we had skirted for miles. Due to my broken Trail Blazer, Sam and the boys were waiting with Seth beneath the shade of a tree when we arrived. It was so good to hear their excited cries of, “Mommy!” We all chatted and then Lacey turned loose her terrors that freshly weaned puppies become. We collected my things, loaded everyone up, and headed back towards Crane. We fed the boys, got them an ice cream for the road, and once again explained why it was so important momma was gone for the week. I let them know I was proud of them for helping daddy while I was gone and we all headed home. For those of you that have read this long (bless your heart, seriously!!!) you may be wondering why I felt the need to chronicle an entire week of day work. No, this isn’t because of that lie that “if you didn’t post it on social media, did it really happen?” As some of you know, I day work for Sam and others without giving the play-by-play. This isn’t about any sort of recognition for myself but a larger world view for those seeking it. · I posted it because Lacey has shown a strong desire to share the story of beef production and I wanted to help in her mission to do so. I am not running my own cows therefore limiting the rights I have to share my experiences due do the potential ramifications to others. I would love to see more beef producers take on the task of chronicling their operations in a way that benefits their income and the industry as a whole. 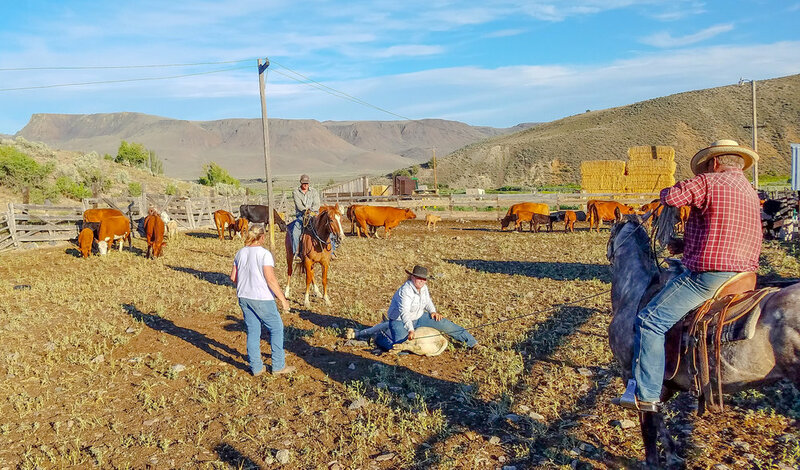 · I posted it because I am continually asked about my cowboy life after a traumatic brain injury. I talk to other people fighting the battle of this same injury who are looking for hope. Yes, things are different. I must consider my food, water, and sleep more but found that by managing these things when possible, I can push through those times I can’t. Physically, there are a few things that will never come back the same (read, I do the same things just differently.) Mentally, my game is stronger as I learn more about horses, cows, country, people and how they all interact together. · I posted it because I regularly receive requests about jobs that will hire women and/or interns. The Elder Ranch is a great opportunity to gain experience both on the desert and in the forest. They are a cow calf operation with spring/fall calvers, a desire to improve their genetics and explore alternate income sources from the work they are already accomplishing. Be sure to follow Lacey on Facebook and Instagram if you feel like this might be a good resume building opportunity for you in the future! Thanks again to the Elder Ranch for the hospitality, memories and fun- let’s do it again!